The very first time I visited the Mosetén Ancestral Lands, in 2006, I was working for an NGO and traveling in the company of a Bolivian colleague. We visited several communities in of the subtropical Andean foothills of the region of northern Bolivia known as Alto Beni. The NGO worked throughout the region, both with Mosetén communities within their Ancestral Lands, and with communities of colonists from the Andean highlands who had settled outside the territory. My colleague, a charming and voluble agronomist, explained to me that Mosetenes have a totally different form of social organization than the colonists. “The Mosetenes have a cacique [chief],” he told me, “while the colonists have a general secretary.” Interested, I asked what a chief did that was different from a general secretary. The agronomist was stumped. I was intrigued. What lies at the heart of the question that stumped the agronomist is, in fact, a long-standing question in Bolivian (and Latin American) politics and social sciences: is there a fundamental difference between peasant and indigenous communities or between peasant and indigenous identities? If so, how could it be characterized? Or is “peasant” just another word for “indigenous” (and vice-versa)? Does each word merely emphasize different aspects of the same situation: a role in production and a position in the market on one hand versus an ethnic condition and millennial tradition on the other? Or do they refer to different conditions of being or ways of worldmaking? Responding to these questions has led to fascinating debates (both academic and political) that call out issues of identification, race, ethnicity, citizenship, belonging, and indigeneity(*) These debates have been central to understanding (and, perhaps to producing) the indigenous political movements that came to the fore in the 1990s and have remained centerstage ever since. While that debate is rich and important to understanding political actions in rural Latin America, it often glosses over the specific political, economic and social networks that are mobilized in each individual community in order achieve political goals. Organizing, even organizing around ethnic identity, isn’t only a question of identification. Communities are faced with practical decisions about what social networks and political strategies are likely to be effective. How do communities – in this case in a community that faced an existential threat to its livelihood and lifestyle – identify strategies and adapt them to their purposes? Asking these questions suggests returning to a much older set of literature. Anthropologists working during the 1960s and 1970s(**) were finely attuned to the specific political, social, and economic networks operating in the rural communities where they worked. Often adopting an “agrarian studies” framework, they gave detailed accounts of land tenure practices, the role of political power-brokers, and social and economic networks. 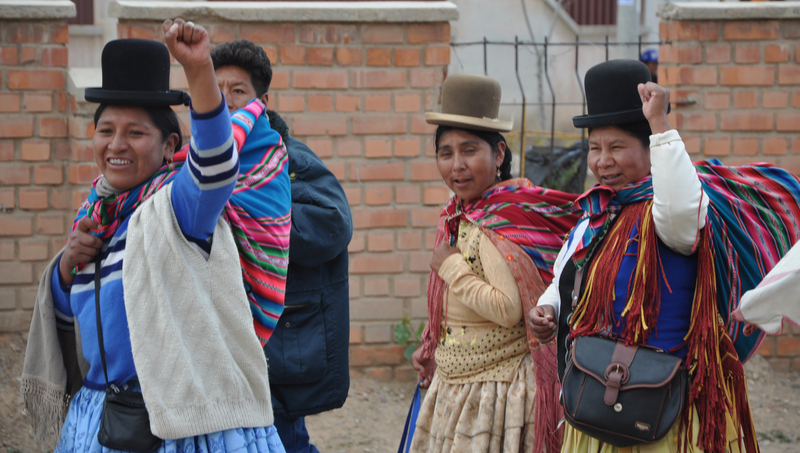 With some notable exceptions (***), they largely glossed over questions of ethnicity and identification that motivate anthropology of Bolivia today. But their work still has something to offer those of us who are interested in rural communities. My agronomist friend assumed that the organization of an indigenous community would reflect indigenous forms of social organization. This assumption made sense in light of the multicultural movements of the 1990s. But such an assumption – that we understand something important about how a community is organized and politically active by understanding the processes of identification underway there – can only take us so far. By casting political activism as a corollary to indigenous identity, this assumption discounts indigenous capacity to organize in novel ways as communities face new threats. Even worse, by implicitly contrasting the activism of indigenous peoples with non-indigenous communities, it risks essentializing indigeneity and sets the stage to question the legitimacy of claims by indigenous communities that do adopt novel strategies for political activism. Processes of identification have certainly been elemental in the struggles of indigenous people, but they are only part of the story. In my article in LARR, I aim to expand on that story, in part by returning to questions that anthropologists were asking in rural communities a generation ago. What are the networks? How is land held? How do political brokers operate? What strategies do particular communities adopt? Exploring these questions requires considering both the possibilities and limitations of the political context in which specific communities were operating, and their active, creative, and intentional strategies to achieve their goals within this context. (*) Refer to the work of Canessa, Postero, Fabricant, Rivera, Albó, and Albro cited in my article in LARR. (**)Refer to the work of Clark, Dandler, Eckstein, Heath, Leons, and Stearman cited in my article in LARR. (***) Refer to the work of Leons cited in my article in LARR. Chuck Sturtevant is a PhD candidate in anthropology at the University of Aberdeen’s Centre for Citizenship, Civil Society and Rule of Law. His research applies an ethnographic approach to citizenship, the state and political practices. He holds an MPhil in Ethnographic documentary from the University of Manchester. His film Habilito: Debt for Life was recently published in the journal Finance and Society.